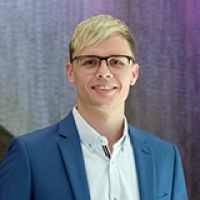 He has always dreamt of running his own business one day, says business alumnus Jake Barker who is now the general manager for B2B businesses HR Matters and Race Marketing. “I love my job – it’s always so varied! I work with a great team who are all focused on delivering the best outcome for our clients. I also love being able to forge the direction of my businesses while gaining input and ownership from our staff. AUT’s practical and forward-thinking nature attracted him, Jake says. He says the workplace experience at the end of the business degree is an example of this forward-thinking approach. There were many highlights throughout his studies, Jake says. “I enjoyed studying alongside my fellow students, participating in the events on campus and being able to engage with my lecturers whenever I needed. Studying at AUT is so welcoming, multi-cultural and forward thinking. Enjoy your time at AUT, Jake advises other students.